PACs Connected To Top Republican State Lawmakers Have a $4-To-$1 Fundraising Advantage Over PACs Connected To Top Democratic Lawmakers. LANSING (MAY 22, 2018) — With all 148 seats in the state Legislature on the ballot in 2018, donors are investing heavily in the Republicans who could lead the House and Senate next year if the GOP maintains control. Meanwhile, Democratic candidates for leadership jobs have fallen well behind their GOP counterparts in political action committee fundraising. Lawmakers who want to win leadership positions in the Legislature usually set up their own political action committees, known as leadership PACs. . Through these PACs, they can raise unlimited amounts of money from donors and interest groups to help their parties try to win a majority and to build goodwill among their colleagues. From Jan. 1, 2017, through April 20, 2018, the 30 state lawmakers with the most active leadership PACs had raised $3.44 million, according to an analysis of campaign finance records. Twenty-four of the 30 lawmakers were Republicans, and only six were Democrats. A listing of the lawmakers and their fundraising totals is available here. 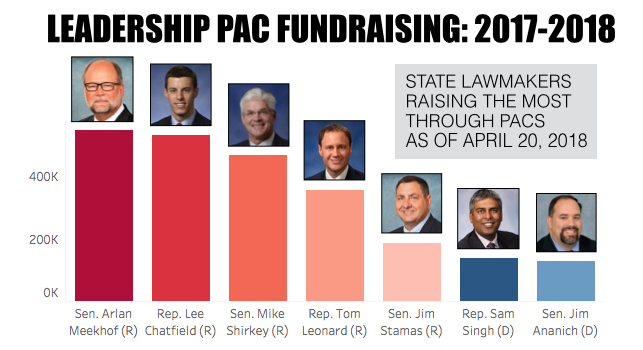 The five lawmakers raising the most through leadership PACs were all Republicans. Republicans have an advantage because they currently control both the House and the Senate. And while many political observers expect Democrats to make gains in 2018, donors aren’t shying away from supporting potential future GOP leaders. Term-limited Senate Majority Leader Arlan Meekhof, a Republican from West Olive, has raised the most money through PACs at $548,974 since the start of 2017. That’s his fundraising total across the four PACs he used to raise money over that time. The total doesn’t include money transferred from one of Meekhof’s PACs to another of his PACs. After Meekhof, the two lawmakers raising the most money through PACs have been two Republicans who could lead the House and Senate in 2019. PACs connected to Rep. Lee Chatfield, a Republican from Levering, have combined to raise $530,205. Chatfield is expected to be the next House speaker if Republicans maintain control of the House in November 2018. Republicans currently hold 63 of the 110 seats in the House. Sen. Mike Shirkey, a Republican from Clarklake, is expected to be the Senate majority leader if Republicans maintain control of the Senate. Currently, Republicans hold 27 of the 38 seats in the Senate. Shirkey’s Compete Michigan PAC has attracted $467,091 in contributions from Jan. 1, 2017, to April 20, 2018. Current House Speaker Tom Leonard’s PACs have raised $354,650 over that time. Leonard, a Republican from DeWitt, is running for attorney general in 2018. The PAC of Sen. Jim Stamas, a Republican from Midland, has raised $138,401, making him the fifth biggest PAC fundraiser in the Legislature. 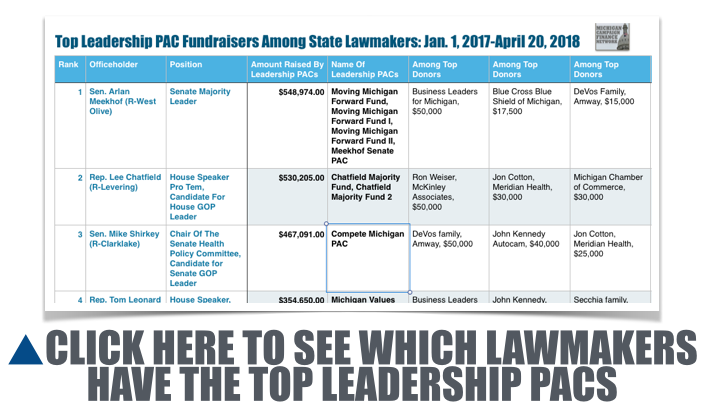 The Democrats raising the most money through PACs have been term-limited House Minority Leader Sam Singh, a Democrat from East Lansing, and Senate Minority Leader Jim Ananich, a Democrat from Flint. Singh’s PACs have combined to raise $138,401. Ananich’s PACs have combined to raise $129,523. Rep. Chris Greig, a Democrat from Farmington Halls, is in the running to be the next House Democratic leader. Her PACs have raised $93,827 since the start of last year, making her the third biggest PAC fundraiser among Democratic lawmakers. Overall, the five Republican lawmakers raising the most money through PACs have brought in $2.08 million. The five Democrats raising the most through PACs have brought in less than a quarter of that amount: $490,386. To see a list of the 30 lawmakers raising the most money through leadership PACs and which donors have contributed the most, click on this link. Some of the individual contributions to lawmakers’ leadership PACs have exceeded $25,000. For instance, the Business Leaders for Michigan, a group that advocates on behalf of business executives, has given $50,000 each to a PAC connected to Leonard and to a PAC connected to Meekhof. Likewise, Ron Weiser, a businessman and chairman of the Michigan Republican Party, has given $50,000 to Chatfield’s PAC efforts. Meridian Health President Jon Cotton, Autocam President John Kennedy and the Michigan Chamber of Commerce PAC have each given $30,000 to Chatfield’s PACs as well. Kennedy has given another $40,000 to Shirkey’s Compete Michigan PAC, and Cotton has given $25,000 to Shirkey’s PAC. Shirkey’s PAC has also received $50,000 in contributions from members of West Michigan’s DeVos family. On the Democratic side, the largest donor to an individual lawmaker’s PACs has been the United Auto Workers (UAW). The UAW Voluntary PAC has given $30,000 to Ananich’s PACs.